Inside Showbiz’s September issue was made more memorable with one afternoon that gave fans the opportunity to have their issue signed by cover star Xian Lim. Garnering the most votes during the online poll at www.insidepinoyshowbiz.ph as 2012’s Inside Showbiz Hottest Man, Inside Showbiz placed the already sensational Xian Lim on the cover of the magazine this September. The autograph signing was done with fans and mall-goers all anxious to get a glimpse of the fast rising actor. Fans flocked to get a hold of the magazine and rushed to line-up to get their magazine signed. A big commotion happened when people recognized Xian Lim as he approached the venue. Those who got there early were able to line-up first, eventually getting their copy signed and having a photo taken with Xian. 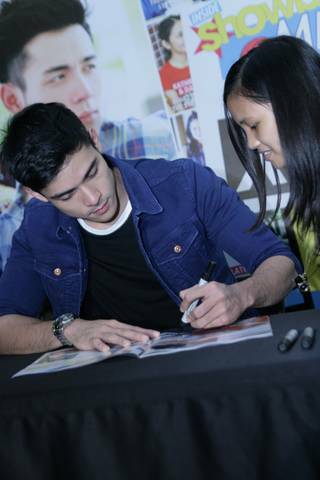 More than a hundred copies were signed with Xian graciously smiling to all his supporters who went. The magazine fearlessly listed the top ten reasons why he is set to be the next leading man of his showbiz generation, as he boldly shared about his noticeable sense of style, his take on negative feedback to him, his being a hopeless romantic according to the alleged apple of Xian’s eye, Kim Chiu, and more. Inside Showbiz has everything you need to know to get closer to cover star Xian Lim this September. Get your copy of Inside Showbiz, on stands now!